No shootout has been as difficult as this one pitting the Aprilia Tuono V4R APRC ABS against the BMW S1000R and KTM 1290 Super Duke R. Not just in how tight the outcome of the scoring (which was stupid close), but more so in the intangible elements of emotion, sensation and the if you have to ask, you wouldn’t understand bliss of why we ride motorcycles. As much as we attempt to adhere to objectivity, mathematics and science when trying to determine why one motorcycle wins a shootout over oftentimes equally outfitted competitors, this is the first shootout where we must concede that we are flat out in love with the winner of this shootout. And, that’s actually saying a lot because we’ve been in love for years with the bike that came in third! The great thing is, if you disagree with us, you simply can’t go wrong purchasing any one of these motorcycles. 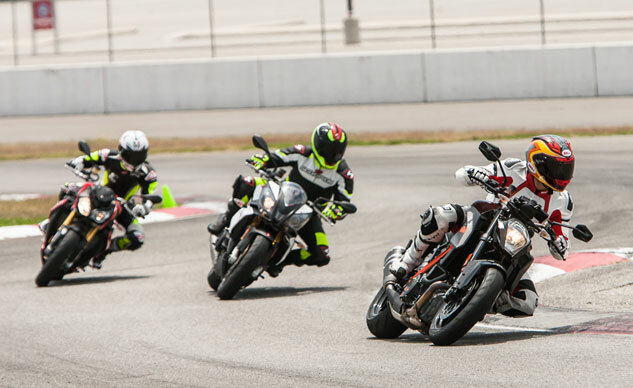 With a V-Twin, a V-Four and an inline-Four from which to choose, there’s an engine configuration available to fit any personal preference, electronic rider aids up the wazoo, and more usable performance than any liter-size repli-racer could hope to have. The cream of the super streetfighter crop, an undulating road, and a corporate gas card. What more could we ask for? Seriously, can it get any better than this? We don’t know how, but we hope so. Fodder for a future shootout. But enough with the pontifications, let’s get on with shootout at hand. The KTM’s orange trace shows the V-Twin’s superiority over its four-cylinder rivals working with 300cc lesser displacement. 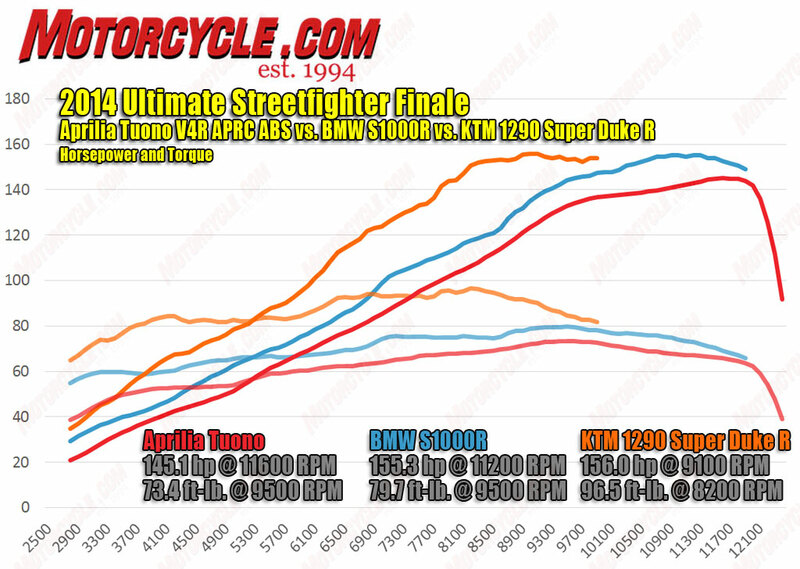 The BMW’s peak horsepower is level with the Super Duke, but its torque doesn’t come close. 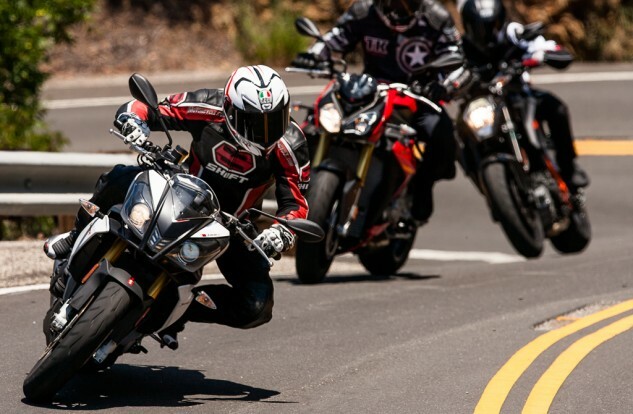 The Tuono’s engine is a thriller but puts out less power everywhere than the S1000R, sliding another nail in the coffin of the theory that V-Four engines have more torque or midrange power than an inline-Four.